What’s noticeable is that the colour only begins to emerge and encroach on the edges of the white as one gets further from the prism, and Newton’s “pure” green colour only appears to arise when yellow and bright blue mix, these last two then decreasing in prominence. It’s easy to see why Goethe concluded that colour was a phenomenon arising from the interface of light and darkness, and not by differing refraction. Does the pattern not suggest two bi-coloured spectra radiating from the light-dark interfaces as the light emerges from the prism, and mixing to produce the familiar spectrum? Indeed, this way of representing the light is used in his own famous sketch of his “crucial” two-prism experiment, though it’s not used in most of his diagrams. A little thought makes his own explanation clear: the effect is produced by the diverging parallel beams of refracted pure colour, and the changes are from progressive subtraction from white, rather than addition to it. Incidentally this phenomenon makes you wonder if the first of the countless illustrators of textbooks only read the first chapter of Opticks to make his erroneous representation (my first picture) and everybody else just copied rather than – dare one suggest it – doing the experiment. But it’s worse than that. I did the experiment in school physics, and I remember the light box, the prism, and the pretty colours all being on a sheet of paper whilst I used my pencil and ruler, and later crayons, to record the result. And what did I record? Just what I’d seen in books before, that assumed Newton’s theory: nice coloured beams bending twice. And none of the other 30 in the class, nor in the years above and below, nor in schools across the country and round the world, every draw the nicely criss-crossing bands of primary and secondary colours of reality. We all draw what we think we see. I wonder what happens to the odd kid who asks the physics teacher why his experiment doesn’t look like the one in the book? Enquiring minds, I suspect, are urged to enquire no more. Anyway, the next question is why Newton came up with his subtractive explanation rather than Goethe’s additive one, since the data of the experiment (or of any of the prism experiments) really can’t determine which theory is right, as some quite prominent scientists have conceded. Newton set great store on avoiding “hypotheses” and drawing only inevitable conclusions from experimental evidence – like BioLogos’s Melanogaster, only perhaps less confrontational. This is how he presents his research in Opticks, as a series of experiments, some deep thought, and the right conclusions. The classic way of doing science. But it’s obvious from his early notebooks that, like Darwin, this was more rhetoric than truth. Newton claimed at the Royal Society that though the corpuscular theory of light didn’t disagree with his theory, he was indifferent to it. But in fact that theory informed all his experimental work, just as Darwin’s evolutionary convictions coloured his research despite his protestations that they followed it. Light corpuscles, varying in speed or size, would plausibly be differentially refracted by glass, but would have no logical link to Goethe’s light-dark interactions, rational though they are and consistent with so much evidence. As ever it was the idea that came first, and then the supporting observation. …and distinguish its Circumference into seven Parts DE, EF, FG, GA, AB, BC, CD, proportional to the seven Musical Tones or Intervals of the eight Sounds, Sol, la, fa, sol, la, mi, fa, sol, contained in an eight, that is, proportional to the Number 1/9, 1/16, 1/10, 1/9, 1/16, 1/16, 1/9. He sees seven colours because Pythagoran numerology says there ought to be seven, just as light must be refracted because Galilean (née Democritan) atomism says it’s made of particles. One last point on this: Goethe’s theory of colour, for all its faults, remains a theory of colour. 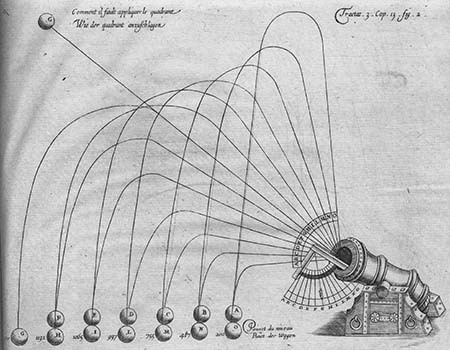 Just as Galileo had already dismissed colours as a purely mental effect, so Newton’s theory dispenses with them immediately (interesting how in his diagrams they tend to appear as algebraic letters unrelated to their names), being replaced first with “angle of refrangibility”, then with theoretical invisible particles. Later, colour became a wavelength, and now it is whatever virtual and inconceivable entity quantum theory makes photons. Colour can be anything, in fact, that makes the maths work, even if completely unintelligible, apart from colour itself – which can’t be measured. To orientate you, the incident light beam comes from the right, and the refracted Newtonian spectrum (not fully formed) obviously goes left. An initial reflection from the glass travels off to the bottom. 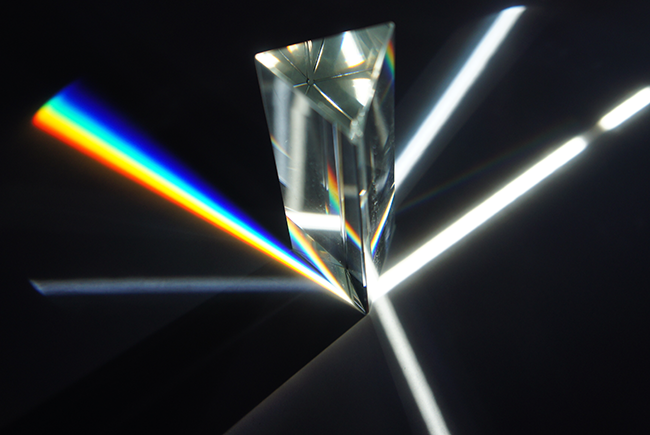 But the white beam at 2 o’clock, showing little or no divergence, comes from internal reflection at the point where the emergent spectrum starts, and it in turn emerges with minimal refraction at the base of the prism. If you look carefully this beam is tinted red on the right and blue on the left, but there’s no real spectrum. There’s other interesting stuff going on too. 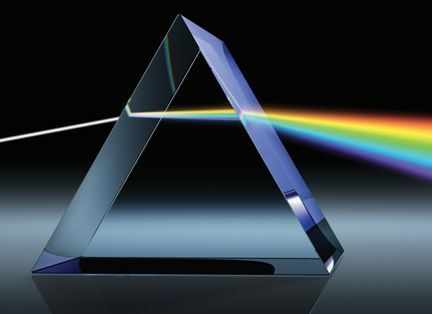 So in direct contradiction to the standard diagram, little or no differential colour refraction occurs when the light enters the prism, nor as it passes through the glass. Pretty well all of it occurs at the angled glass/air boundary. Goethe’s theory, or what little I’ve learned of it of it, doesn’t seem to explain that. But neither as far as I can see does anything I learned at school. If the experiments are so misrepresented, how much is the resulting theory to be trusted? Not the experimentumn crucis – blue refracts more, right? Did Darwin outline a theory of common descent before the Beagle voyage. (I haven’t read much on Darwin in the way of biography, so I don’t know what the answer is. What’s the biographical basis for saying that the theory shaped the observations? On the optics, Feynman’s QED (quantum electrodynamics) is an interesting book for the mathematically challenged, like me (and short.) It’s been a long time since I read it, but it went far beyond my physics education. The evidence comes from Darwin’s notebooks, and Gertrude Himmelfarb’s venerable biography gives a good account (ch 6). Darwin started a new notebook in July 1837 and (quoting GH) “the theory of mutability informs almost the whole of this first notebook.” That’s less than a year after the Beagle returned, and there’s no real sign that he had any thought of “transformism” during that, so the genesis must be around that time. Natural selection was a later development, of course. But on his return the mutabiloity of species was “all the rage in one form or another in the medical schools of London” (Bortoft), so he would have been aware of it, and his notebooks show he was more than simply acquainted with it – it was guiding his work. Not to forget the evolutionary views of his grandfather Erasmus, of course, which must have affected him once the subject was raised in his mind. I’m curious as to why you think that the data of the prism experiment can’t decide between the explanations of Newton and Goethe. 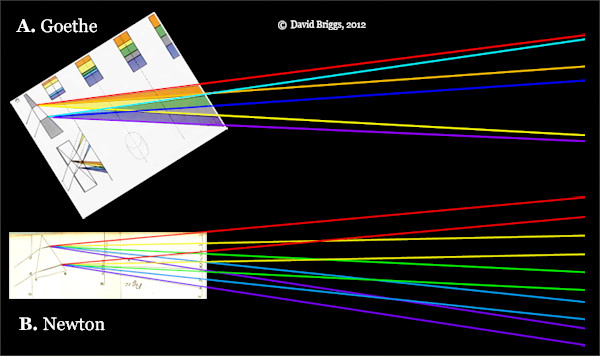 Goethe’s explanation predicts that the coloured rays would cross over more and more with increasing distance beyond the white wedge, while Newton’s predicts that the coloured rays should become more and more cleanly separated. Newton’s experiments were conducted over a distance of about 22 feet, which is much longer than the white wedge, and more than amply demolished the explanation resurrected by Goethe. 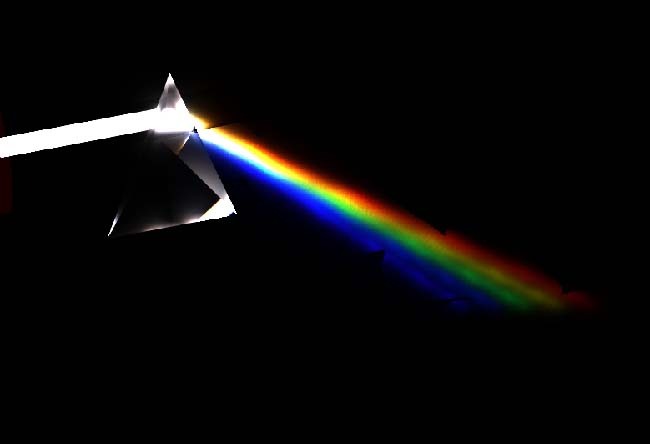 Also, if you apply the procedure used by Newton to explain the spectrum of a wide beam to your final example, you’ll find it predicts that the beam should emerge with narrow reddish and bluish fringes that die out further from the prism, which seems to be exactly what you have observed. David, thanks for posting – your own website looks fascinating and I will browse it at leisure: colour theory has always held some fascination for me as a doctor, a lifelong photographer and a lapsed painter. I shall look forward to reading what you have to say on colour vision, which I deliberately avoided introducing here, though I’m interested in how Newton’s experiments overlap with colour perception. Anyway, I bow to your professional knowledge on such matters. You must understand that I dipped my foot in the basics of Goethe’s colour theory as a way of approaching his way of doing science, which in term was in pursuit of the wider themes of analytical versus intuitive knowledge that we’ve discussed here through the work of people like Michael Polanyi. It just seemed to illustrate that well, especially in relation to what happens once it’s popularised. So the main reason I didn’t consider the effects of Goethe’s scheme further out along the refracted beam was that I didn’t think of it! It does seem obvious though, which makes me wonder why he seems, despite having no “scientific” credentials, to have been taken so seriously by mainstream physicists at the time, and given discussion-room since (see the Wikipedia entry here). It was that, rather than a full personal evaluation of the theory, that prompted my suggestion that either explanation might have occurred to Newton, had he not been primed by corpuscular theory. I just wonder if the physical limitations of the apparatus available might have something to do with it. 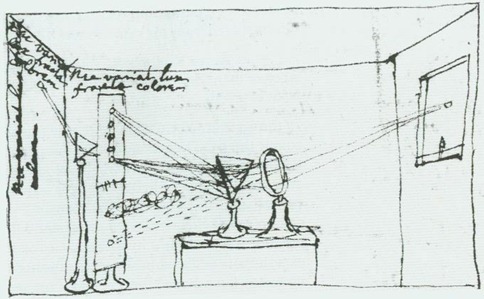 In both Newton’s and Goethe’s time sunlight was the brightest available source, and the experiments required a restricted aperture and focusing through fairly rudimentary lenses. Even at Newton’s 22 feet (larger than I imagined – mother must have had a big house) things must have been quite difficult to discern clearly. I’m still not clear on the formation of the reflected and refracted secondary beam though – it appears to have remained largely parallel and as narrow as the primary beam that becomes a spectrum (as it ought, being internally reflected from that). Why not just a second spectrum? Jon, I think the Wikipedia article is very selective about responses to Goethe’s theory. In his A History of Color (1999) Robert Crone sums up the reaction as follows: “It is not surprising that Goethe, to his vexation, got no response from the physicists of his time…. The people who listened to Goethe were philosophers, artists, and distinguished ladies with whom he spoke about his color theory in the Kurgarten. They are the same as those who in this century still remain supporters of Goethe’s color theory: philosophers like Wittgenstein, artists like Kandinsky, holistic prophets like Rudolf Steiner, and all those others for whom the exact sciences are incomprehensible and overwhelming, and therefore abhorrent.” Among later scientists, Goethe certainly did have an influence on physiologists, notably Purkinje, Muller and Hering, but this was for other aspects of his work than his theory of the origin of colours. In Newton’s explanation of the refraction of a broad beam of light, differential refraction at the first interface causes an initial angular divergence of the spectral components, creating a narrow reddish fringe on the acute side and a narrow blue-violet fringe on the obtuse side of the beam at the second interface, where further differential refraction adds to the initial divergence. However in the reflected beam the red and blue violet fringes swap position, so that the second differential refraction tends to reverse the first one, and the rays proceed from that point roughly parallel. David – thanks for second paragraph. Puts the thing to bed neatly… thinking about it, it makes Newton’s experimentum crucis almost redundant, at least as far as schools teaching basic physics with limited equipment are concerned. Regarding your first I’ve had the same overall impression as Crone: Rudolph Steiner’s name keeps popping up wherever one looks researching Goethe (not to mention even further out people like Gurdjieff). Nevertheless, it’s interesting that any exact scientists (Helmholtz and Heisenberg come to mind immediately) were interested enough in the issues he raised to discuss them sympathetically. I suspect it’s part of a wider issue than that of Goethe – I’ve been surprised in recent months how many of the great scientists, especiailly of the late nineteenth to mid twentieth centuries, were philosophically literate and keen to draw boundaries around the capabilities and range of “the exact sciences” (rather than finding them overwhelming or abhorrent, or even wrong). As for “incomprehensible” – maybe yes, in many cases, but that was because of familiarity rather than ignorance. You’ll find it very interesting to compare the original sources with the spin attached to them in the Wikipedia article. Helmholtz said that in his 1853 lecture he was “mainly interested in defending the scientific point of view of the physicist against the accusations which had been made by the poet” (Helmholtz, Goethe’s Anticipation of Subsequent Scientific Ideas ), and the quotation that in the Wikipedia article appears to offer support to Goethe’s theory actually refers to Newton’s theory, not Goethe’s. Ah Wikipedia – you have to love it as a sociological window on who’s most bothered to push a particular subject. David, I’ve now had time to read your section on colour vison, which is excellent – especially (given how I started this piece) your children’s page with the admonition to teach the adults properly! Bearing in mind that you are concentrating only on colour, and that the same level of complexity applies if one is studying perception of form, movement, stereoscopy, and then on up the scale to cognitive meaning and then rational assessment, it’s an astonishingly good visual system. It would be interesting to know how many of the same kind of high-level features have had to evolve separately in other visual creatures like cephalopods or insects, which after all have similar needs in comparable visual environments in order to survive (but that’s outside your department, I guess). I glanced at your stuff on pigment-mixing too – hard to believe that the average artist nowadays would apply themselves to the theory and get to know individual pigments so well. Maybe that’s why the i-pad is in the ascendency. Thanks again for both your input here and the link to your site. You’re welcome Jon, and thanks for the discussion. I should have a go at cleaning up a few things like that on Wikipedia myself, but it may turn into a time consuming battle, and I want to finish some improvements on my own site first. I’m afraid you’re right, insect and cephalopod vision are not my department! Interestingly, if art forums are anything to go by, there are actually many amateur painters who are quite obsessed with the minutiae of individual pigments, even if they take little interest in other technical questions. Ultimately I think you have the same choice of understanding what you are doing, or not, with both digital and traditional painting.